Five track CDEP - or, according to the band, a special limited edition three track CD that contains 2 live bonus tracks - cute, guys. At times, like the opener “Moore”, and flanged out “Passed Us By”, it kinda reminds me a bit of those overdriven guitar/bass 4 track/boombox recordings that many a amateur home recording types have in our closets, including myself. I don’t mean that in a bad way or anything - I like those recordings, and I dig TR’s also. The live tracks are better, two untitled murky 8-10 minute jams, the first of which brings to mind early Subarachnoid Space. The feedback heavy squall of the final track even moves in on Skullflower territory, although it’s not quite THAT heavy (but then again, almost no one is). They do it pretty darn well, and the live tracks in particular make me want to hear some more. 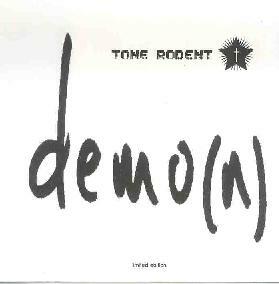 For more information you can visit the Tone Rodent web site at: http://www.geocities.com/tonerodent. Contact via snail mail c/o Adam Watkins; 760 North Laclede Station Road; St. Louis, MO 63119.